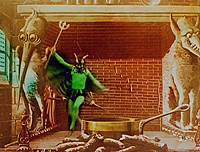 Synopsis: A devil congers a woman out of a cauldron. She does a quick dance. In beautiful color! Scoring: 2 Bb clarinets, alto sax, percussion, bells, Harmophone, and piano.